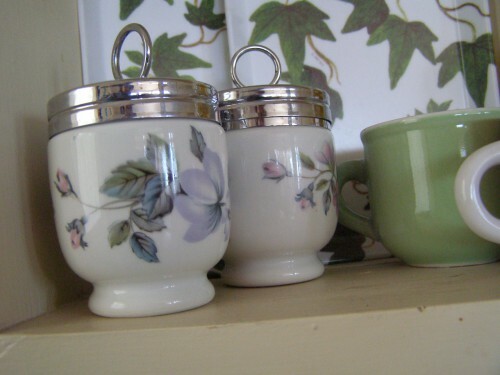 How to coddle eggs: Egg coddlers have been in my family for as long as I can remember. Their role was to decorate my Grandmothers dining room. 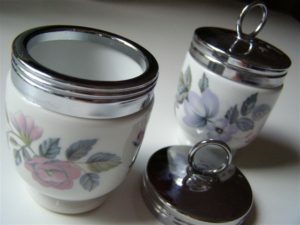 To my knowledge, her egg coddlers never, ever made it onto the family dining table but you can be sure that if they had, it would have been considered a real treat!Coddled eggs became a fascination for me later in life when I came across a coddler sitting all alone on the shelf of a charity shop. For the price of £2.00, I took it home and decided to amass a collection. 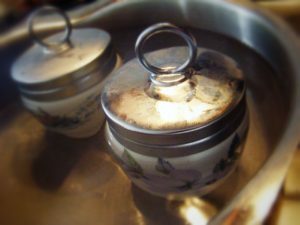 However, my plan to take over the world one coddler at a time was thwarted by the Antiques Road Show who showcased a few, genuinely antique, Royal Worcester coddlers. From then on everyone in the UK became their own antique dealer and porcelain expert, which meant coddlers disappeared from charity shops all over the land. Not only this, but they took pride of place in glass-fronted dining room cupboards all over the land too, cursed to become decorative forever! It took me many years to collect the 4 that I have and I am proud to announce that, not only do they play a role in decorating our dining room/kitchen but we do use them from time to time too. 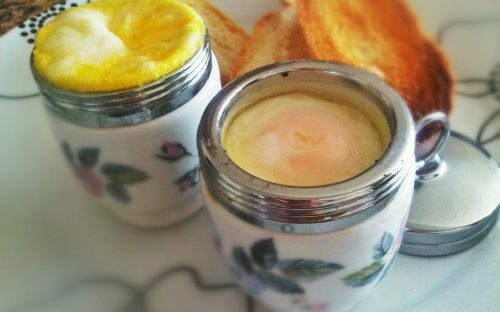 It gives me great satisfaction to present a coddled egg to our guests here in Paradise, where I often take the standard coddle recipe and give it a bit of a tweak. To be honest, I only really started using my coddlers regularly when I presented Enzo with a pair of boiled eggs for his breakfast one morning and was surprised at his reaction. I watched as he first peer at them suspiciously, then proceeded to toss each hot boiled egg from hand to hand in an attempt to peel it. It turns out that Enzo, who was born in Italy and has spent most of his life in America, has absolutely no information on how to eat a boiled egg. I pledged from that day on that all of his boil-style eggs would be coddled ones. With hindsight, it was just as well I didn’t introduce him to Marmite soldiers. I’ve been keeping that delight firmly up my sleeve for a couple of years now. 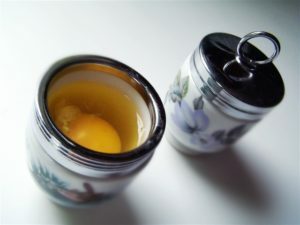 I bet you’re wondering the how, what, why and when of the egg coddler – welcome to the club! However, I will share the little information that I do have. 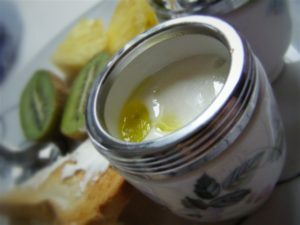 Coddled eggs are traditionally barely cooked to a ‘mollet’ consistency meaning ‘soft’ in French, and cooked in their shells. 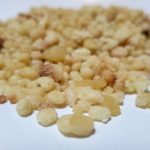 For the linguists amongst us, the term ‘molly coddle’ may have already popped into your head. I believe that this is how the term ‘coddle’ came into being. 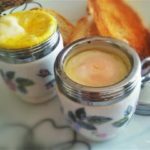 I usually keep a dish of traditionally coddled eggs in the fridge and use them to top salads but they are truly best served warm over almost anything! According to the records of the Royal Worcester Museum, the first coddler was manufactured in the 1880’s. From 1910 to 1928, egg coddlers were referred to as ‘premier egg cups’ which is believed to have been as a result of them being used on the Imperial Yacht of the last Tsar in 1900. I have the ones that are large enough to carry one egg but double egg (or duck egg) size are also available. Now it’s time to get yours out, or remove them from Grannies cupboard of prized possessions, dust them off and get cooking! Now that you have the basic recipe, you can go ahead and invent recipes of your own. Our scrambled coddled eggs with black truffle in the centre, were a bit of a winner at breakfast time here when we served them up to a couple of our bed and breakfasting guests. 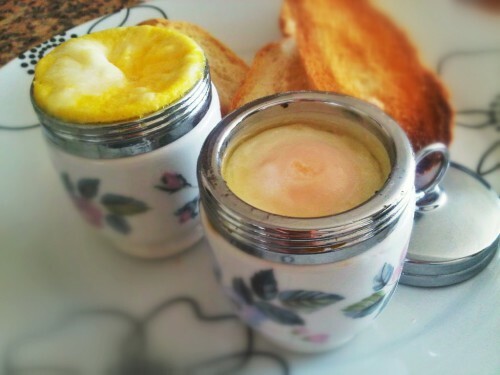 There, it’s never been easier to give your breakfast a bit of ‘egg-citement’. The most difficult part of coddling eggs is finding the eggs coddlers. Good luck with that!